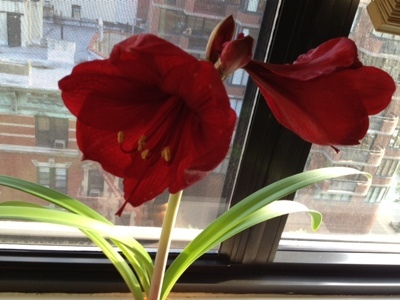 We just received a digital photo of the Amaryllis budding in our NYC apartment from our house guest Steve Greenberg. We are now in Lake Bled, Slovenia. We were thrilled to get it. We waited two years to see this flower bloom again. Just before we left on this trip, we noticed signs of life coming out of that bare pot on our window sill. The older we get, the more we appreciate the simple things in life. We hope you wait for us, you gorgeous specimen. Not you Steve. We were talking to the flower. 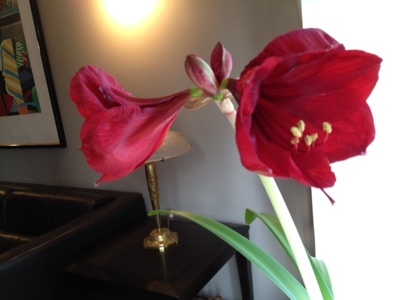 This entry was posted in digital, senior lifestyle, tech and tagged Amaryllis, Croatia, Lake Bled by loiswhitman. Bookmark the permalink. Enjoyed your post today about your budding flower. I’m sure Steve isn’t feeling too slighted. Always enjoy reading what’s going on with you all. We just returned from Peru and Ecuador. great trip with Gate 1. Phil and Anne Saxe (traveled with you to India/Nepal). Yes I liked your blog on the wonders of digital photography and it’s application for making everyday life a little more enjoyable.